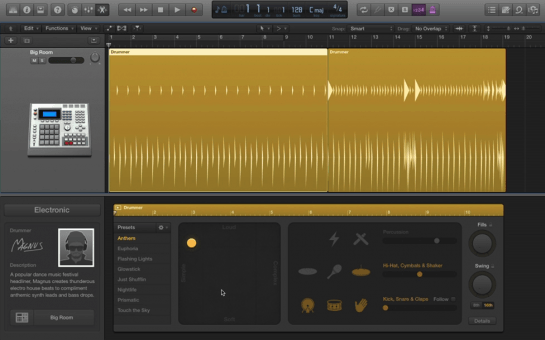 Logic Pro 10.1 introduces advanced new features for EDM and Hip Hop track creation and tons of enhancements to streamline all types of music production. Get more new sounds and more powerful tools that keep the creative process flowing. EDM and Hip Hop take the spotlight. EDM and Hip Hop round out the bill in Logic Pro 10.1 with ingenious, time-saving beat-making tools and powerful control over every last detail of your tracks. It’s beat programming taken to a new level. Choose from 10 new beat creators with pro skills in cutting-edge styles including Tech House, Trap, Dubstep, and more. They follow your lead to dial in the groove you’re going for. Choose from awesome-sounding kits covering a range of electronic styles. Bend and shape the sound with the right controls always at your disposal. Mix, match, and swap out the kit pieces with hundreds of thumps, kicks, strikes, claps, and more. Then let your custom drum machine spark the creation of some fresh new beats. Press any note to generate a sequence with Note Repeat. Remove them just as simply with Spot Erase. Easily change rate, note length, and velocity on the fly to create intricate rhythmic patterns, build drama, and create big drops. The Piano Roll Editor gives you new ways to create and manipulate MIDI data. Add or subtract a series of notes in a single swipe with the new Brush Tool. Compress and expand a selection of notes with new graphic tools. See more in less space with the Collapse view and use the Drum Name view to spot those drum-hit notes with ease. Your automated changes are now embedded within any region, so you can repeat or loop them with all those swirling, sweeping, twisting effect parameters going along for the ride. 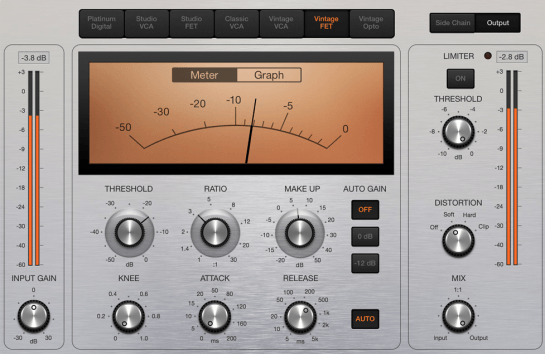 The Compressor plug-in now features a fully scalable, redesigned interface inspired by the look and feel of legendary studio favorites. With the new Classic VCA, there are a total of seven models. And the Histogram Meter view lets you see the results of your parameters, controls, and knob movements like never before. Sort and prioritize all Logic Pro and third-party plug-ins with ease. Put your favorites at the top of the menu. And create custom categories to keep hundreds of plug-ins ready, right when you need them. With 10 new Mellotron instruments and over 200 patches focused on EDM and Hip Hop styles, there’s a lot to be excited about in this free update.